With all these spoilers and rotation, I started thinking about some Cantrips that will probably never be replaced or out gunned in Modern, and how certain Cantrips suit certain decks, but all effectively do the same thing. With this in mind I knew that Nikachu had recently changed his Merfolk deck list to include Peek, which is defiantly an interesting choice of Cantrip and not one we see played often. I thought I’d drop him a message to see if he’d be willing to let us know his thought process on this addition to his deck and some other Magic related questions! Nikachu was gracious enough to respond to our questions with some nice detailed answers. 1) What made you decide to you use Peek over the other Cantrip options in Modern? I’m not particularly interested in cantrips, which is why I’ve never play-tested Serum Visions. I wanted a new card that I could play on turn 1-2, and I figured seeing the opponent’s hand was a worthwhile effect given I had a positive experience with Vendilion Clique. The most valuable part of Clique was just looking at the hand, taking a card wasn’t as impactful. 2) What did you cut from your list to put Peek into your mainboard? I think I cut Reejerey and Harbinger of the Tides. Harbinger is proving to be really situational or ineffective (bouncing humans creatures backfired because they have Vial or they want more etb effects). Reejerey is great but I’m already running 4x Phantasmal Image and I have to make cuts somewhere. I don’t know if 4x Peek is the correct number but it’s where I want to start. 3) Have you seen more of a success by using Peek? Yes, Peek is giving me a lot of free wins. I can very comfortably win games knowing exactly what to play around. I beat a lot of UW Control, Mardu, and BGx decks knowing what I had to play around or knowing I didn’t have to play around anything. Knowing if the opponent has Settle the Wreckage is enormous. 4) What are the downsides to using Peek, does it prove to be weak in any match ups? There is very little cost to playing Peek. It just takes up some card in your deck, but improves the chances of drawing your more high impact spells like Master of Waves. Peek is very poor vs graveyard strategies because the most important information is in the graveyard. Peek doesn’t seem particularly useful vs Burn because of Eidolon and the fact that most of the spells do very similar things. 5) Why did you decide to change to peek all of a sudden? Was it to do with a meta shift or something else? Merfolk cannot reliably play a UU Spell on turn 2 given a 16 U manabase. Many games you’ll have Island and Mutavault or be in one land because of a one land Vial hand. Today his is a problem because so many decks are proactive. In the past cards like Dismember, Remand, or Spreading Seas were great turn 2 plays. Today, Dismember is too painful or doesn’t have enough targets, Remand is obsolete, Spreading Seas doesn’t mana screw that many players; spirits and humans can use the mana, Mardu is basically a 2 color deck, UW Control mostly ignores it. Seas is still a great turn 5+ play, but it’s no longer a high impact turn 2 play. 6) What do you enjoy most about Merfolk as a deck? Merfolk is a really challenging but rewarding deck. Always there are new problems it faces but I’ve overcome them all. I’ve never felt like Merfolk was hated out of the Metagame and I’m very happy with my results. It’s a deck that can adapt to change. 7) What would you say is your favourite card in the deck? My favourite card is Master of Waves because he’s really powerful and upsets most of my opponent’s. The card steals games you would normally lose. 8) If you could build another deck, what deck would you build next? Realistically, I would build Humans because it’s a less flexible, but more powerful Aether Vial deck. They have a different set of unique tools to attack players. Unrealistically I would build Kiki-Exarch. This deck is incredibly underrated. Twin was a powerful deck because the shell was powerful in addition to a simple 2 card combo finish. The shell is still there and while Kiki is a more vulnerable and expensive win condition, a 2 card combo still exists. It’s just Blasphemy that this deck goes from 14% metagame share to 0%. That didn’t even happen to Infect, Dredge, or Bloom Titan after their bannings. People just don’t want to work for their wins. 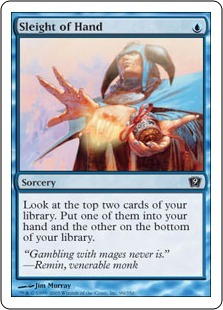 9) What do you think about the recent ravnica spoilers? The spoilers are mostly unexciting for a Merfolk player. I think Assassin’s Trophy is overrated. It can deal with narrow problematic permanents but it’s going to be a bad removal spell vs generic permanents which is 90% of your targets. It’s still a necessary 4x for BGx going forward but people don’t realize the consequences of giving your opponent a land. I will gladly accept any extra mana while thinning my deck of lands. Will you really want to Assassin’s Trophy Thalia’s Lieutenant? Or Goblin Guide? Or Noble Hierarch? Or Rattlechains? Modern is more than just Urza’s Tower and Karn. So what are some other cantrips and what can they offer to different decks? Some we definitely see as regulars to the Modern format, and the are all for the most part just generally good cards. Serum Visions is the cheapest card with the most deck adjusting on turn one, draw to replace itself and then help you set up your draws for next two turns, which early game can be really powerful gives. Being at sorcery speed it has to take up your turn 1, but we won’t see an instant alternative nearly as good, probably because of how powerful it could be. This is good in most decks and is a must for most blue players. Sleight of Hand gives you instant card selection which can be powerful if you are looking for certain combo pieces or an answer to a card on the field. Getting to see two cards right away is very powerful, sorcery feels slow but in certain decks, it is very strong and in Modern it definitely stands out as a combo card. The newest blue draw card in modern, scry 1 and draw, this has card selection and instant speed action to help find an answer to the board but you only get to see one card at a time which can feel underpowered. Seeing a lot of use in control, and some combo decks are using it as well. Instant speed for those decks that need that extra fuel and speed at certain times. Peek is almost a weird Gitaxian Probe but without the Phyrexian mana which as stated above has started to pick up some play with Nikachu (Merfolk Player) using it in his Modern deck and also a lot of control decks have started to give it some air time, to get that extra information for how they want to navigate the game going forward. Downside it doesn’t give you card selection and it is just more digging in a straight line without knowing where that’s going. Though I do think more decks will start to pick this card up, maybe infect could start seeing it. Odd card to add to the list, but decks with big delve threats can target themselves to make their creatures easier to cast. Also can be seen in mill as you can target them to mill two and then you draw. All this makes this card a unique cantrip, as this is not replacing itself in the way of putting anything extra into your hand but instead putting key pieces in place. Also having flashback which can be great a couple of turns later to keep filtering your draws this one card can help you draw four cards and then put four cards into your graveyard where they should be. However, this is very much situational in the right deck. Giving no card selection though whatsoever does exactly what it says on the tin; Faithless Looting. This card has seen a lot of fingers pointed towards it every time a banning comes around. Looking at five cards is way more than any of the other cards we have looked give at but the fact it is only colourless is meant to be the downside. This card makes finding lands or threats with Tron easy, a great tool for KCI to dig for their pieces and now the new Green Affinity uses it to keep up steam throughout the match. so despite this supposedly having a ‘downside’ should this see the next ban? A special thanks to Nikachu for taking the time to answer our questions! Find his Facebook page here! Find his Youtube channel here! Next Post Tribal Cards; A Fierce Addition Or A Faux Pas?